This pack includes 5 activities/games to practice action verbs. *Action verb charades-- cut apart the verbs. Pass out to the students. Have students come up one by one to act out their action verb. If they do not have an action verb (can't act it out) have them write the word on the board. At the end take a look at the words written on the board. Great for introducing linking verbs! 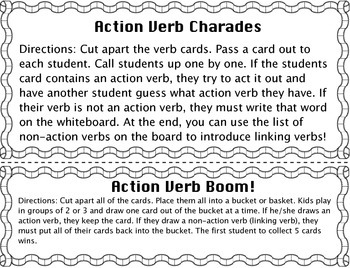 *Action Verb Boom!-- Cut apart the cards. Place into a basket. Have students play in groups of 2 or 3. Have one player draw a piece of paper. If they draw an action verb, they keep the paper. If they draw a non-action verb (linking verb) they have to put all their words back into the basket. 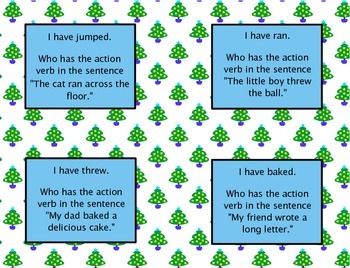 The first player to collect 5 action verbs wins. 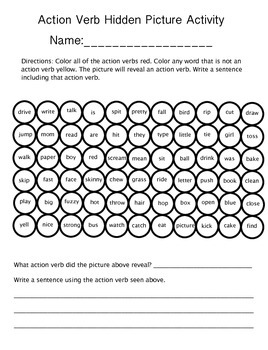 *Action Verb Hidden Picture-- Color all the action verbs red. Color all other circles yellow. The picture will reveal an action verb, write a sentence using that action verb. *Action Verb Joke Activity-- Match each action verb with the sentence in which it belongs. Use the answers to fill in the key and answer the joke. *Action Verbs I have, Who Has-- cut apart the cards and pass all of them out. Have one student read aloud their card. The student who has the next card in line then reads their card. Continue until you get back to the student who started. My students like to have me time them and see if they can beat their time every time we play!